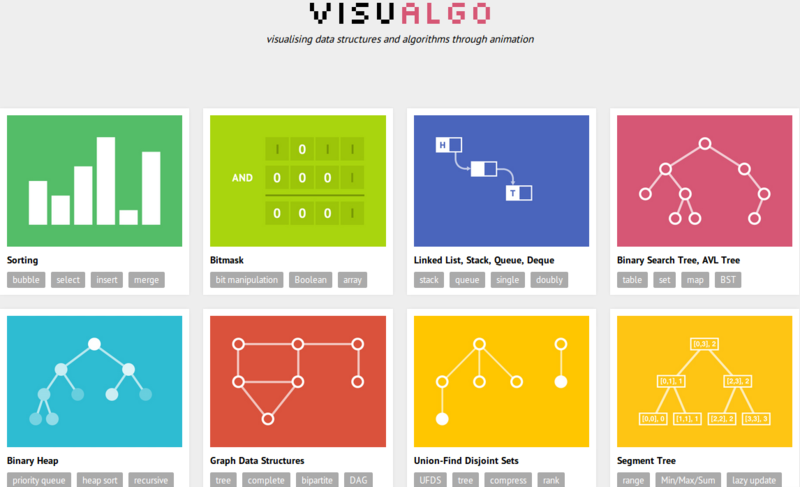 VisuAlgo was conceptualized in 2011 by Dr Steven Halim as a tool to help his students better understand data structures and algorithms, by allowing them to learn the basics on their own and at their own pace. Together with some of his students from the National University of Singapore, a series of visualizations were developed and consolidated, from simple sorting algorithms to complex graph data structures and algorithms. Though specifically designed for the use of NUS students taking various data structure and algorithm classes (CS1010, CS1020, CS2010, CS2020, CS3230, and CS3233), as advocators of online learning, they hope that curious minds around the world will find these visualizations useful as well. VisuAlgo is an ongoing project, and more complex visualizations are still being developed. The most exciting new development is an automated question generator and verifier (the online quiz system) that allows student to test their knowledge of basic data structures and algorithms. The questions are randomly generated via some rules and students’ answers are quickly and automatically graded upon submission to the grading server.